I can hardly think of a place in Southeast Asia with a more mystical underpinnings than Bali. The name alone conjures exotic images of beaches and jungles shrouded in Southeast Asian myth & legend. The reality is far different. You’ll find two distinct camps, equally furious in their resolve to prove that Bali is either the destination of dreams or nightmares. Neither side is entirely wrong—nor right! Planning your Bali itinerary involves more than just finding the cheapest airfare and randomly choosing your accommodations. The island is diverse, so choosing where to go in Bali, based on your travel style is the best way forward. Here are a few Bali destinations to try out on your next getaway. If Kuta weren’t so popular among travellers, I’d leave it right off this list. When you hear travellers complain of the nightmarish Bali experiences, it will likely stem from a stay, however short, in Kuta, Bali’s own beach-bumming surfer’s paradise. For surfers, spring-breakers, and party-animal types, Kuta promises a strong cocktail of sleepless nights, epic ripping on the Indian Ocean, greasy meals at Western restaurant chains, and bargain-basement shopping. 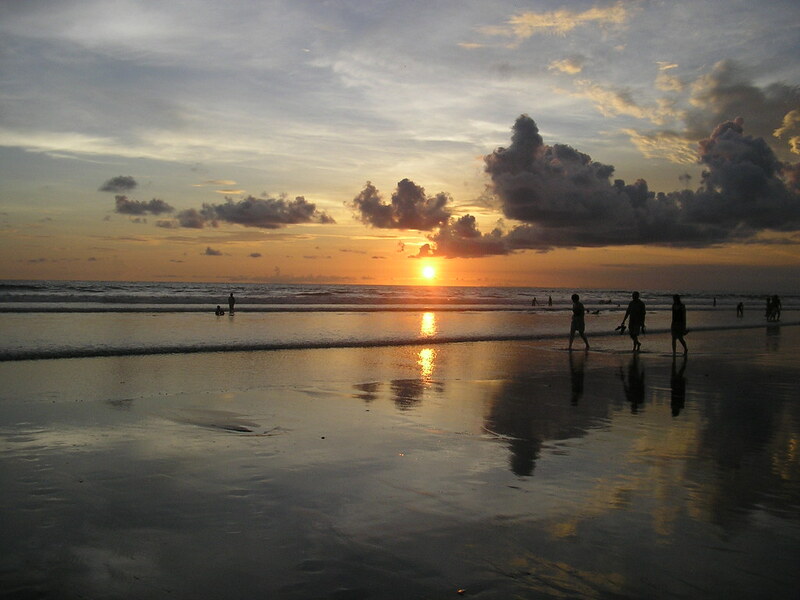 Kuta could very well be the most memorable destination travellers can’t remember. Kuta is located close to Bali’s main airport, meaning you may inadvertently end up in a Kuta hotel for a night if arriving late at night or leaving early in the morning. If you don’t feel like you fit into the description in the paragraph above, better places to visit in Bali await below. Not sure when to go to Bali? Sort out your trip with this complete guide on the best time to visit Bali! Lovina is the Jekyll to Kuta’s Hyde. It’s everything that Indonesia’s most famous island promises to be when you dream of planning the perfect beach vacation to Bali. There’s not a whole lot of things to do in Lovina, and that’s precisely why you might just love it. Nights spent slowly sipping Bintangs, watching the sun slip beneath the volcanic beaches, are bound to slide into a list of your favourite travel experiences. Even better is to explore the area around Lovina where you’ll stumble upon exciting places like Air Panas Banjar, Brahma Vihara Arama and Gitgit Waterfall, one of the top alternatives to touristy attractions in Bali. Chances when choosing where to stay in Lovina you’ll end up in or around Kalibukbuk, the largest village in Lovina Beach and the centre of tourism for the area. Accommodations in Lovina are mostly basic resort- and villa-style rooms or bungalows along the beach. Compared to the more developed south, Lovina is budget-friendly, giving you a chance to score some comfy digs for the cost of a decent hostel bed elsewhere in Asia. Great budget deals like Villa Jaya (starting at $19) and more luxurious options like Villa Teman (starting at $180) lie just outside of the town centre. If you’re looking for a relaxing getaway that’s a far cry from the ruckus of south Bali, Candidasa is your ticket. Just don’t expect to spend your days lazing on the beach. At least not in the town proper. Candidasa was once one of Bali’s premier beach resorts, but poor construction planning left the town with little beach of its own. Even without the wide sand stretches you’d find elsewhere on Bali, overlooking the water are perfectly-situated hotels built for pure relaxation. The quality of accommodations in Candidasa is generally high, and caters to a variety of budgets. It’s easy in Candidasa to grab killer views without killing your budget. And if you wanted to splurge, well, there are plenty of hotels in Candidasa willing to pamper you in exchange for your mighty dollars. For the quintessential Bali experience, the views from the infinity pools at the Sea Breeze Candidasa are hard to beat. 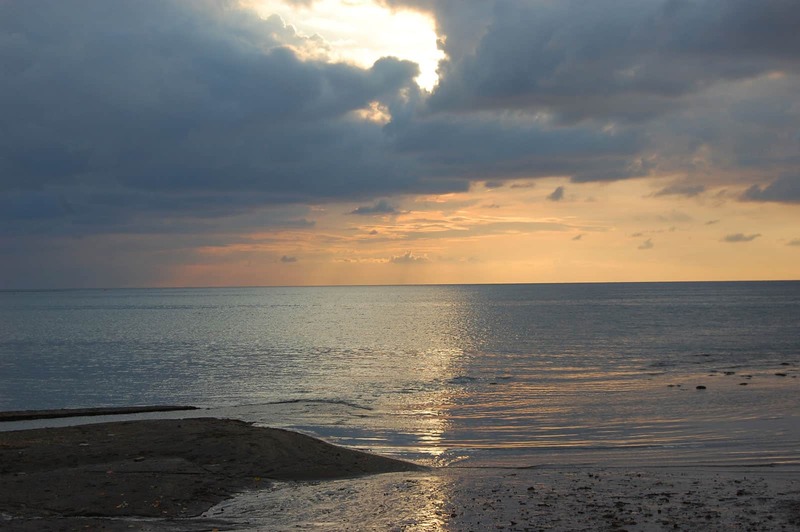 The major drawcard of staying in Candidasa is its prime location in East Bali. Close by you’ll encounter traditional Balinese fishing villages, black- and white-sand beaches, rice terraces, temples, and Tirta Gangga, a water palace that’s become one of the most famous sights in Bali. Like Candidasa, Sanur suits older couples and families rather than backpackers itching to plunge into the Bali party scene. It’s a quiet little town alongside the beach with excellent, if a little pricier, accommodation options than elsewhere in Bali. Sanur Beach won’t win many friends among surfers. Like the town itself, the water here is calm, perfect for families wanting to escape the madness of the Indian Ocean’s forceful riptides. 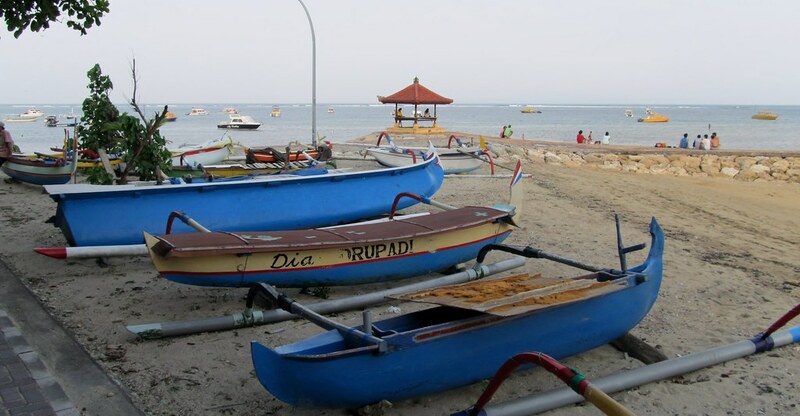 There’s a wide array of accommodations in Sanur ranging between budget-friendly guesthouses and top-tier luxury resorts. 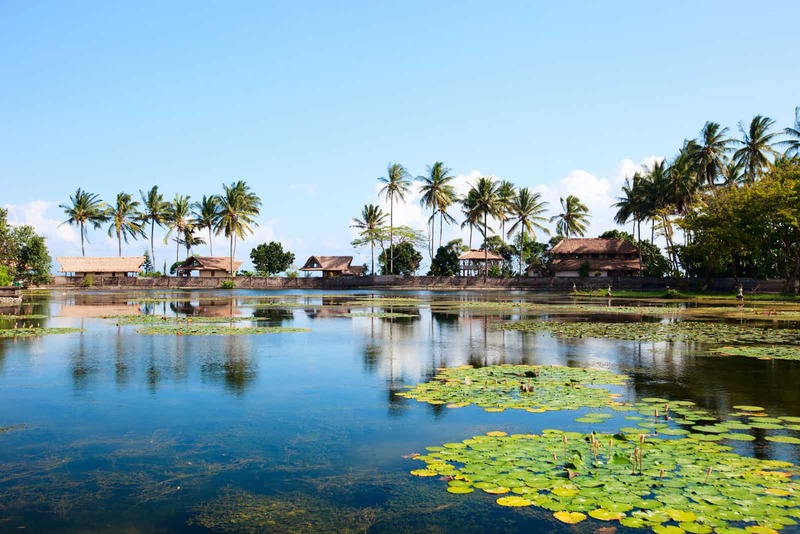 You can’t go wrong with the views, location and Balinese charm of Peneeda View Beach Hotel (starting at $52) or the more luxurious Resort Fairmont Sanur Beach Bali (starting at $275). Are your rupiah burning a hole in your pocket? Unload some of your hard-earned cash at Seminyak, Bali’s most luxurious stretch of coastline. Unlike Kuta, mere miles to the south, Seminyak caters towards international jet-setters rather than younger backpackers. And the accommodation prices reflect it. Finding cheap hotels in Seminyak isn’t impossible (there’s over a thousand to choose from! ), but gets more difficult year to year. For private rooms with private bathrooms, expect to get off your wallet. 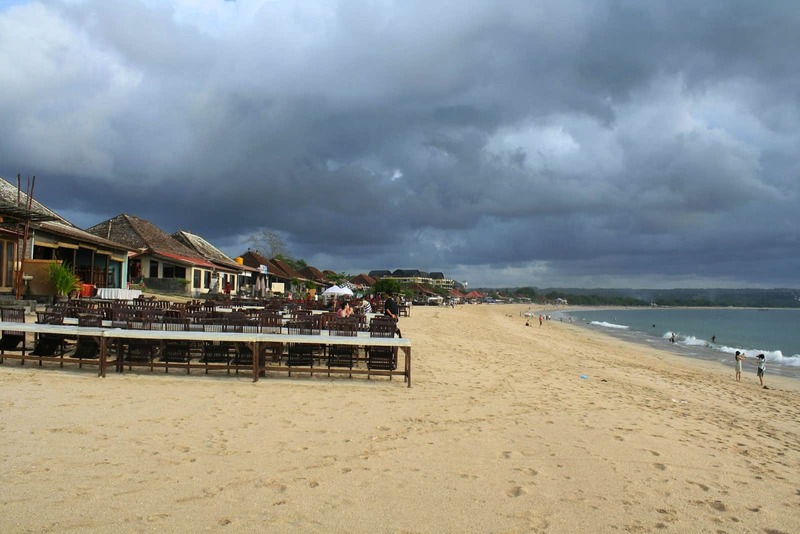 Otherwise, you might find the towns to the south—Legian and Kuta–more budget-friendly. A couple decent options close to the beach are the beautiful garden-laden Puri Cendana Resort Bali (starting at $51) and the excellent value Courtyard By Marriott Bali Seminyak Resort (starting at $118). If you’re not into the 24/7 surfer party scene, the beaches of Seminyak will be a welcome addition to your Bali travel itinerary. 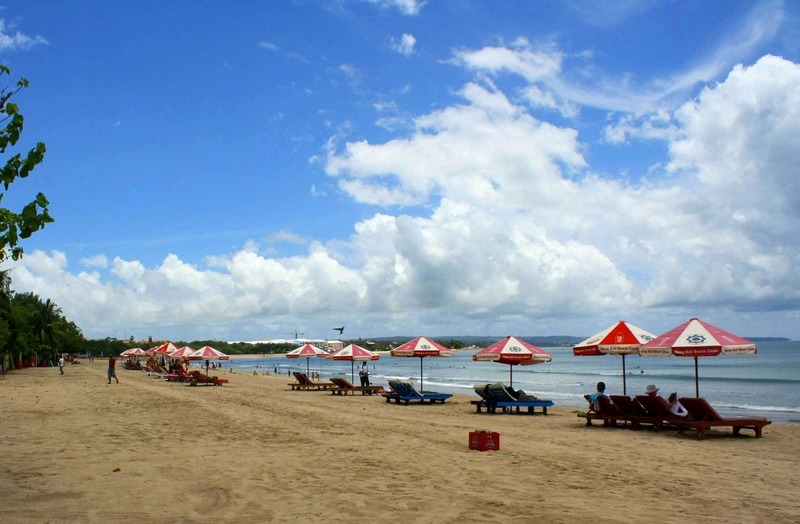 The ultra-wide Seminyak Beach is far quieter than Legian Beach or Kuta Beach at all hours of the day. What you’ll find in Seminyak, compared to its southern brethren, is a more mature and relaxing atmosphere, putting it—at least in my book—among the top places to stay in Bali. That’s not to say Seminyak is boring. The party scene is alive and well with Seminyak hosting some of the Bali most upscale restaurants and bars. Just don’t expect to fit it all in with your pocket change. Sun-worshippers take heed: Jimbaran is one of Bali’s best places to grab a tan. Not only will you find more elbowroom on Jimbaran Beach than in Kuta Beach or Legian Beach to the north, but you’ll also find a stretch of the Indian Ocean that’s less rebellious for casual swimmers. Jimbaran Town itself exhibits the Indonesian hospitality that’s noticeably missing from the streets of Kuta. The hassles here are minimal, and more in line with what you’d expect in the less-touristed corners of Indonesia. Like Seminyak, Jimbaran is hardly a budget-backpacker paradise. Most accommodations in Jimbaran fall in the mid- to high-end range. With these higher prices, you can expect a quieter stay in Jimbaran. Two excellent options are the Keraton Jimbaran Beach Resort (starting at $79) and the eco-friendly Open House Jimbaran Bali (starting at $84). Chances are you won’t solve all your life’s problems by simply visiting Ubud à la “Eat Pray Love.” Even so, I’d bet that spending a week in Ubud will enrich your life—somehow. If Bali has a cultural heart, it’s Ubud. Most of what you’d dream about Bali, besides the beachside sunsets, will be what you’ll fall in love with in Ubud. 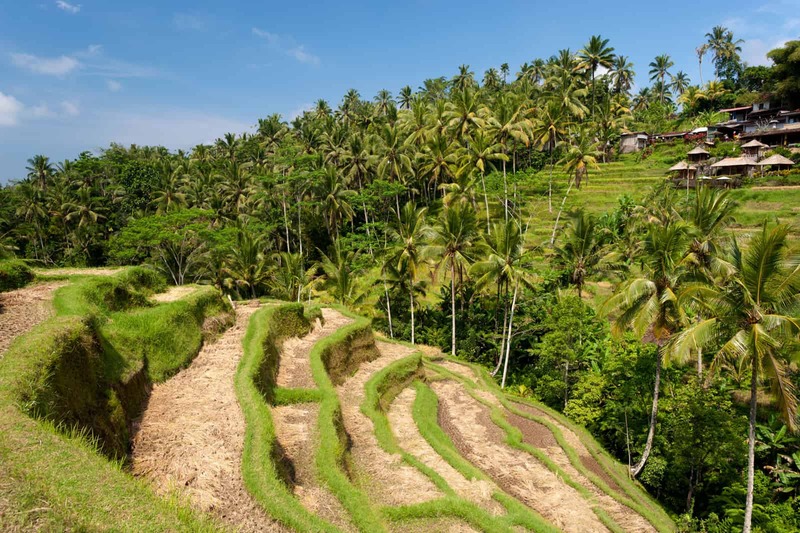 Ubud is a land of mystical landscapes and deep tradition. In staying here, you’ll be in close quarters with rice paddies that topple into the valleys, overgrown jungles hosting ancient Balinese temples, and mischievous camera-stealing monkeys. Although day trip to Ubud is possible from Kuta or Seminyak, I’d recommend staying longer to get into close quarters with Balinese culture and to have time to experience all of the best things to do in Ubud. With all the area offers and the sheer volume of potential day trips from Ubud, you could easily wander around for a week and experience little downtime. Accommodations in Ubud occupy just about every price point. On a tight budget? Homestays will be your best option. Walk outside of central Ubud and haggle to score the best homestay deals. Likewise, mid-range and luxury hotels are generally best outside of Ubud where the vistas—and the value for your dollar—are most impressive. The Goya Boutique Resort (rooms starting at $168) offer just about the best views you’ll find anywhere. Need a spiritual awakening? Spend time in the mystical Ubud. Craving relaxation by the beach in a small town? Lap up the waves in Lovina Beach. Want to party like a rock star? Hit up the clubs and dance until the night grows old in Kuta. Tough year at work? Pamper yourself in the luxury resorts of Seminyak.